The Reina Valera 1960 Thompson Reference Bible, is without a doubt the most complete Spanish study and reference Bible that can be found. It is practically a biblical reference library with more than 7,000 names, places and topics and more than 100,000 chain references. Study helps are "chained" to eight sections at the end of the Bible, where the wealth of details is superior to any other published Bible. It is designed to help the reader identify thousands of significant topics, concepts, ideas, and biblical characters, and investigate references to these topics throughout the Bible. It is a complete system, easy to understand and use. This is an ideal Bible for a pastor, Sunday School teacher, layman or student. 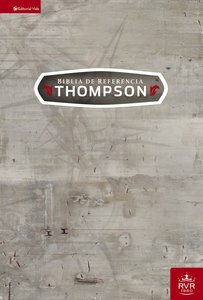 About "Rvr60 Biblia De Referencia Thompson"